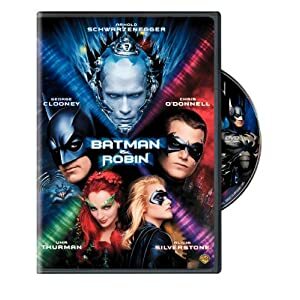 Batman and Robin has a great cast of stars. In addition to Arnold Schwarzenegger, the film also stars George Clooney, Chris O'Donnell, Uma Thurman and Alicia Silverstone. Unfortunately, that's about all of the good stuff that I can say about it. Despite the great cast, this film blows. If you enjoy watching bad movies and actively making fun of them (like in Mystery Science Theater, or the Rocky Horror Picture Show) then by all means pick this one up. Otherwise save your money. NOTE: If you need white elephant gift ideas, this is a pretty crappy gift you can saddle someone with. You're sure to get a few laughs.